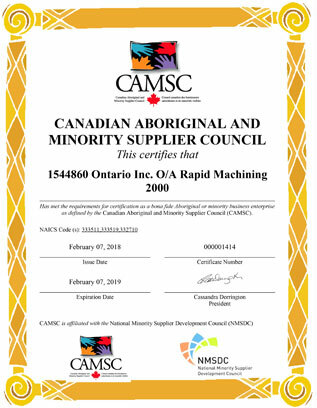 We are proud to have been granted certification as a Minority Business Enterprise (MBE) by CAMSC ( Canadian Aboriginal & Minority Supplier Council). As a certified MBE we have been recognized as a minority-owned, operated, and controlled business in Canada. This certification is recognized in the USA under NMSDC ( National Minority Supplier Development Council). We are happy to be part of the MBE community and appreciate the business and networking opportunity this affords us.